A while back I twittered and blogged about the need for a set of glasses. I had put it off long enough and I found myself starting to have neck pain due to leaning into the computer too much to read. I also found that late at night when I do most of my work, I had a hard time reading. Presumably because of eye fatigue. The mere thought of paying 300 dollars or more for glasses made my stomach turn. In my opinion eye glasses and jewelry are the biggest racket around. It’s just been marked up so much over the years that no one even pays attention to it anymore. Well one of the blogs I frequent outside of the technology field is http://www.lifehacker.com the basic premise behind the site (or at least one of them) is taking everyday situations or expenses and figuring out a way around paying full price. I stumbled across an article on the site that talked about refusing to pay “the man” so much damn money for glasses. “Save bundles of cash by buying eyeglasses online“. I thought it was a great idea, granted there was a bit of un-easy feeling with ordering something like glasses online. It would be like ordering prescriptions online from china. But I read the article a few times over to make sure I knew exactly what I was getting into. I went to my local eye glass outlet, well honestly, I went to about four. I tried on at least 50 pairs of glasses. Everywhere from the “no way in the world I’d wear those” to “hey I could see myself in these”. I took pictures of me in each pair of glasses I liked, then I took multiple pictures of each pair from every angle I could think of. Lastly, I pulled out my trusty Ikea tape measure and measured the length of the glasses from one end to the other as well as each individual lens and the length of the bridge bar the connects the two lenses. You’ll need to know all this information when trying to find the best match online to the glasses you found in the store. I researched the eye glasses websites recommended on lifehacker closely, which had the most options, which had the best turn around and the best prices. I ended up choosing the Zenni Optical website mentioned most in the site. Mainly because the lab work on the lenses actually takes place in the USA. The frames themselves are what come from China, plus they had the best price for the options I wanted. Then the real work began, finding as close of a match to the best of the best glasses I found in the locations near me. Give yourself a bit of time for this, it takes a while going through the hundreds of frames. Matching up measurements, colors weights, materials etc etc. I finally chose the pair that I wanted, now the interesting part. In a feat that I was almost positive would get a reaction like a mother scolding her child, I was off to the optometrist. The problem is that when you tell them you only want your prescription and your “pupillary distance” it’s pretty much a dead give-a-way that you’re going to be ordering your glasses online or at minimum from another vendor. This almost always, from what I’ve heard incites a flurry of discipline and sales pitches. Everything from: “you shouldn’t order your eye glasses online, you never know what you’re going to get” to “are you sure you don’t want to buy your glasses here, we’re running a sale for fifty dollars when you get an eye exam”. This is all bull! First, those fifty dollar glasses end up being just the frames and after you get anti glare, anti scratch, lens transitions and all the other stuff to effectively take advantage of current technology, you’re on a monthly payment plan! Resist the man I say! I got off easy and told the sales guy/optometrist that I was going to have a set of shooting range glasses made. Something they don’t offer at basically any store on the planet. Feel free to use my excuse, even if it’s completely unbelievable… how do you even argue that one!? haha. The rest is a breeze, just go to the site, and the frames you have bookmarked, choose your options, fill in the blanks and most normal pair’s will be at your house in less than a week! I was told that if you do something like transitions or bi-focal, it costs a bit more and takes a little more time. However that is all relative because it can’t physically cost as much as the retail stores will charge you. Best of all, they are almost disposable, in fact I could have ordered 5 pairs for the price of just one at the retail store. Just a few things to keep in mind when you get your prescription (which the doctor is legally mandated to give you a copy of). Make sure they write the prescription clearly, if you don’t understand the handwriting, have them redo it. Period. They won’t like it because they aren’t making any commission off of it, tough. Also if you get a “PL” on your prescription as I did, that means “0” so don’t freak out when you don’t see a “PL” on the drop down box when filling in the fields for your prescription strength. And lastly, you only get a very small window when you order the frames to make any kind of changes to your order. For example, I accidently chose silver instead of gun metal for my frame color. It was only one number off and I botched it, I called them up and was glad to hear an American voice on the other end. The woman explained that they get shipped almost immediately and that they would try to catch it before it went out. Unfortunately I didn’t get so lucky but at 32 dollars a pair, if I didn’t like them that much… I’d just buy another pair. I’d HIGHLY recommend using this method to order your glasses hopefully you have the same experience I did, and if not… it was only 32 bucks so what the heck? 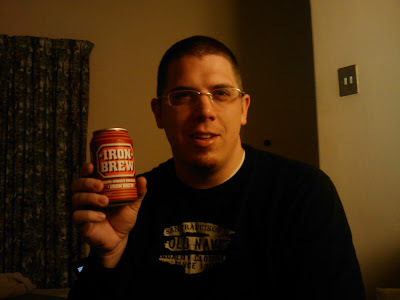 Not the best picture but the only one I could find, this was in Africa.. Side note, if you ever get a chance to drink Iron Brew you need to.